Super Mario Bros, with a few new faces, in your Internet Browser. The original Super Mario Crossover, which hit the net out of nowhere in April 2010, was an interesting port of Super Mario Bros but with a whole new set of characters to chose from other than Mario, including Samus, Link, Ryu, Megaman, Simon and more. 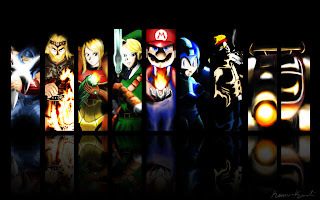 The different characters were designed to play as they would in their original games but in the Mario game world. It was a hugely popular success, quickly racking up hundreds of thousands of plays across the world wide web. Wired's Chris Kohler considered the game a "surprisingly thoughtful 8-bit mashup." It was a nice touch that music from the respective character's own game played when they were selected. Fast forward to February 2012 where Explodingrabbit.com has published the highly anticipated Super Mario Crossover 2.0. In this version there are two new playable characters: Luigi from Mario Bros. and Bass from the Mega Man series. On top of the new cast there are a plethora of new features. One of the main new additions is being able to chose the generational build of the game world from: NES, Gameboy, SNES and Current. Plus the option to 'mix it up'. This not only affects the look but the sound effects and music too which is just fantastic. The game plays just brilliantly, there's no slowdown or awkwardness to the controls, they feel very responsive and fluid. I normally hate using the keyboard to play any non-FPS or RTS games on my PC but this plays absolutely fine with the keyboard. None of the characters move sets or animations feel out of place or unresponsive. The developer did an astounding job of getting all the characters to play well in the Super Mario Bros universe. Learning to work with the characters different strengths and weaknesses gives the game a tonne more replayability, after running through the first world as Samus I found myself reloading the page so I could replay the first world as Bass. It's exciting to see just how the different characters fare in each of the different levels. The developer, Jay Pavlina has breathed a new life into the decades old, though still very playable, Nintendo game and given gamers another source to procrastinate from studying, working or other such productivity. It is by far my favourite flash game of the last few years and as extremely unlikely as it is, I would love if Nintendo sought out to port this to 3DSware so I could play it on the go. The whole concept of the game leaves all these ideas floating in my head, what if you could play as Megaman in Zelda, Mario in Metroid and Link in Castlevania?